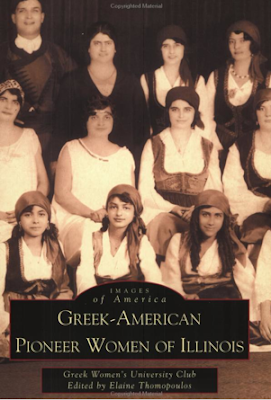 The book "Greek American Pioneer Women of Illinois" was edited by Dr. Elaine Cotsirilos Thomopoulos and published by Arcadia Publishing in 2000. Like most of the books published by Arcadia, this one includes many photographs and captions. You can view the 242 names mentioned in this book below. As usual, I borrowed this book through my local library inter-library loan program. If you are interested in this book I believe it is still available for sale, or you can also utilize the inter-library loan program. Greek-American Pioneer Women of Illinois, produced through the Greek Women's University Club, chronicles the struggles and triumphs, the pathos and joy of five women who emigrated to the United States from 1885 to 1923: Georgia Bitzis Pooley, Presbytera Stella Christoulakis Petrakis, Theano Papazoglou Margaris, Venette Tomaras Askounes Ashford, and Senator Adeline J. Geo-Karis. With over 125 historic photos and documents which span the years 1885 to 2000, this book showcases the life stories of immigrant pioneer women, their families, friends, and the emerging Greek-American community of Illinois. Greek women pioneers faced a difficult life when they arrived in the xenetia (strange land) from the rural farms of Greece. They did not speak English, and were bewildered by crowded Chicago and the alien culture. Yet these brave, spirited women triumphed over adversity and embraced their adopted country to become exemplary citizens.